The Nonprofit Management Institute is an educational and training program designed to meet the professional development needs of local nonprofit professionals and maximize their impact in serving our community. Participants in this six-week program will focus on specific topics in nonprofit management and organizational development, which may be put to immediate use. These practical skills are designed to help participants enhance the capacity of their organizations. The Institute is made possible through a collaborative effort of the Hayden-Harman Foundation, High Point University, and the Guilford Nonprofit Consortium. The Institute is hosted and facilitated by High Point University (HPU) and the Guilford Nonprofit Consortium. 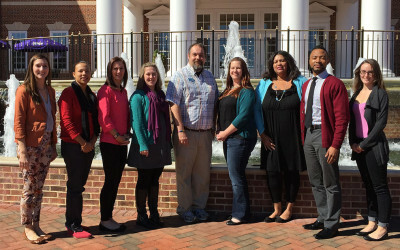 The Department of Human Relations, Sociology and Nonprofit Studies at HPU provides a participatory hands-on training and development curriculum used as the primary resource for the participants’ professional development experience. Classes are taught by Dr. Pamela Palmer, professor of nonprofit leadership and management at High Point, at the university’s state-of-the-art facilities. Participants can use this course work for credit that can be applied toward the Duke Nonprofit Management Certificate offered by Duke University Continuing Studies. The next session of the Nonprofit Institute will begin in Summer 2019. The class sessions will be held at High Point University.There is a non-refundable registration fee of $500 for all sessions for staff and board of Consortium members within Guilford County. Fees are doubled for members located outside of Guilford County. Participants will receive Institute notebooks, significant handouts and take home tools, journals, and food at each session, which for the classes, will include a continental breakfast, lunch and an afternoon break, as well as a graduation certificate. Registration information is available on our Events page. Your organization must also be a paid member of the Guilford Nonprofit Consortium. 2014 Fall Nonprofit Management Institute graduates.